Supporters Direct have asked the IFA to stage a mini tournament as part of their annual conference, which is at Enfield Town FC on Sunday the 8th July this year. Matches will be played on the two full size pitches adjacent to the Ground, and will be 30 minute, 11 a side games making the tournament an ideal preparation for Worldnet. The tournament will start at 10 am and finish by about two thirty pm – the format will be two groups of four and a final which saw the two group winners playing off against each other for the Winner of the Tournament. 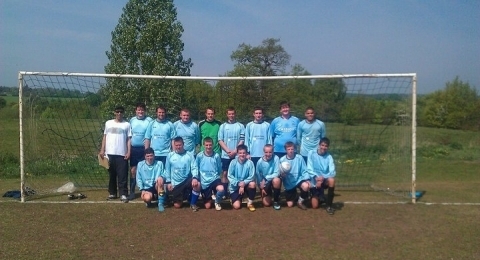 WIFC have entered a team and look forward to taking part. WIFC recorded a double header double this Saturday morning, with wins against AFC Wimbledon in the London Cup Semi-Final and Punch Drunk FC, the Ipswich Town supporters team, in the IFA league. 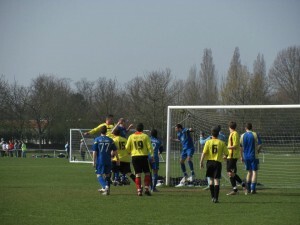 Having won their London Cup group comfortably, WIFC continued their good cup form in the bright Bushey sunshine. After a cagey opening, Joel Moody set the home side on their way with a low finish from the edge of the area for his 9th goal of the season. 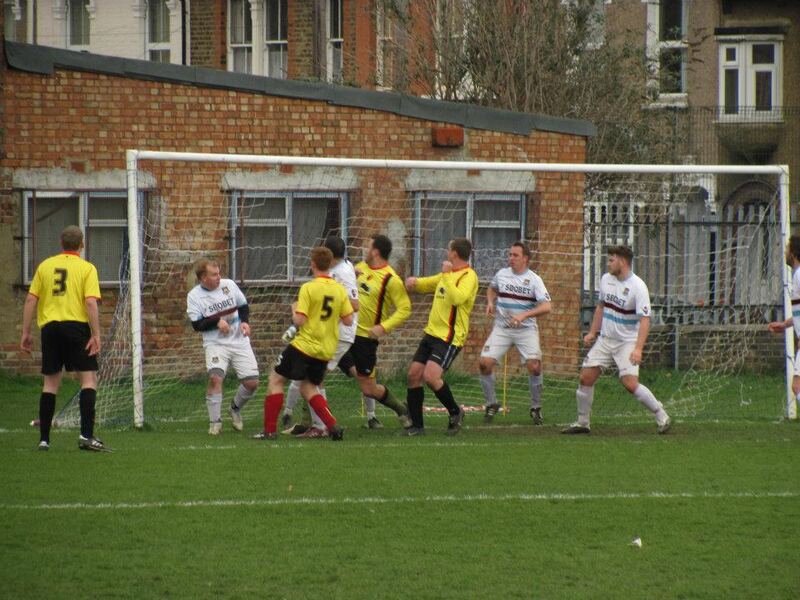 WIFC doubled their lead when industrious midfielder Stuart Holdham thumped home a header from a Rob Sterry corner. Further chances came and went, before Richard Walker pulled off a fine save from a one-on-one to preserve the two goal lead just before the break. In the second half, WIFC looked to put the game out of the hard-working visitors reach, and were able to do so. A Rob Sterry lob made it three after good work from winger Andy Lewers, and Sterry completed a brace after more unselfish centre forward play by Chris Dew. 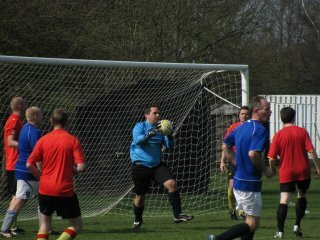 With Walker injured, Daz Sear was called into action from the bench, and his one-handed stop kept the score at 4-0. However, Sear could do nothing with ten minutes to play as AFC Wimbledon got a first consolation. Frank Smith then restored the four goal cushion with his first goal for the club, but a further consolation completed the scoring and a cup final berth for the home side. Meanwhile, the second game saw a goalless first half, during which WIFC created the greater number of chances and with some better composure in front of goal could have gone in at half time in control of the game. Alex Prentice, Tim Down, and Andy Myall all spurned good chances, and at the other end it took a great save from Tom Beck to insure the home side went in level at the half way point. Looking to press their defence a little more in the second half, manager for the day Martin Pollard tinkered with his formation and it soon paid dividends when Andy Myall did well to get control of the ball with a challenge to go past the keeper and finish into an empty net for his 3rd goal in 2 games against Punch Drunk this season. Shortly afterwards James Collins topped off his man of the match performance by battling through a couple of challenges to poke the ball inside the near post to double the lead. As the end of the match grew nearer, Punch Drunk threw caution to the wind and with injuries beginning to affect the WIFC squad, the visitors began to apply a lot of pressure and grabbed a goal back through Jarrod Ellis. With backs very much to the wall, WIFC held out for the win, but not without a penalty scare right at the end, but with so many bodies in the way of the refs vision he couldn’t give Ipswich the decision. Richard Walker; Dan Willis, Aidy Spender, Stuart Nicholls, Paul Whittenbury; Stuart Holdham, Frank Smith; Joel Mooody, Dave Soloway, Rob Sterry; Chris Dew. Subs Andy Lewers, Jamie Parkins, Maurice Clarke, Daz Sear. Tom beck; Ed Sterry, Martin Pollard, Richard Wenham, Matt Ainsley; James Collins, Dave Morren; Andy Myall, Warren Flanagan, Tim Down; Alex Prentice. Subs Richard Betts, Marc Duffy, Simon Jones, Matt Wells, Daz Sear. Preparations are almost complete for WIFC’s weekend double header, as they take on both AFC Wimbledon and Punch Drunk FC, who represent Ipswich in the IFA, at the Met Police Sports Club in Bushey. It’s only the second time in the club’s history that two games have taken place on the same day – the first time saw defeats to both Fulham and Preston in December 2006. The Internet ‘Orns will be hoping for a better outcome this time, and with 33 players to choose from a lack of options certainly couldn’t be used as an excuse if it doesn’t happen. The game with AFC Wimbledon is the semi-final of the IFA London Cup. With West Ham already having beaten Barnet in the other semi-final, both sides will be hoping to book their place to meet the Hammers in May. WIFC have saved their best form of the season for this competition so far, having won all three group games to set up the home semi-final tie. Joel Moody will be part of the squad for the semi-final. “AFC Wimbledon and WIFC have a rich history, it’s always a tough, fair contest with a decent team” said Moody, who made his 150th appearance for the club last weekend. “I’m looking forward to hopefully getting closer to the elusive 50 goal mark with a win and a potential Cup Final appearance” added Moody. The history between the two teams dates back to May 2005, and Saturday’s game will be the 9th between the two sides. 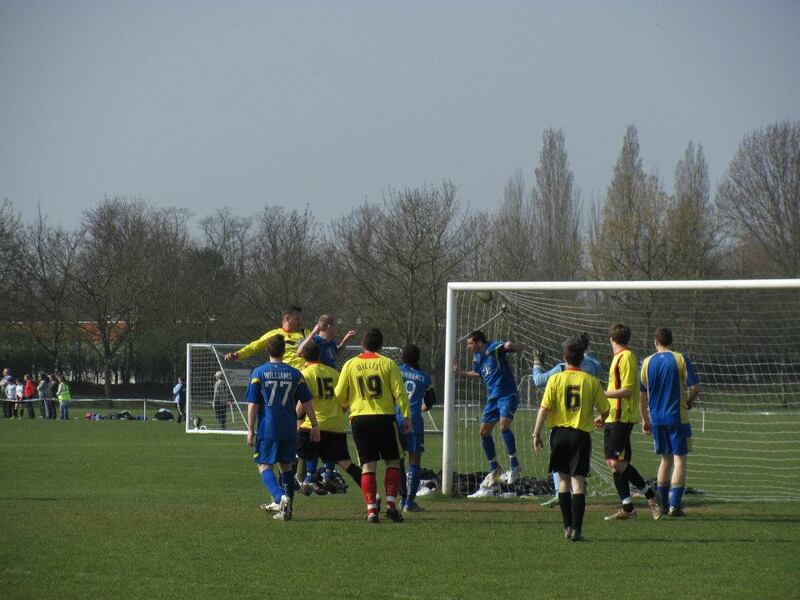 The most recent saw WIFC beat AFC Wimbledon’s B team in the group stages of the London Cup in January. WIFC hold the upper hand overall, with six wins in the series, but that will count for little on Saturday with a Cup Final berth up for grabs. As for Punch Drunk FC, the second part of the double header sees WIFC take on one of their most common opponents, with this being the 15th meeting between the two teams. The first match was at Worldnet in 1998 and though Punch Drunk won that game 1-0, WIFC have held the upper hand since, with only two further wins for the tractor boys. The second of those was on their last visit in January 2011, when Richard Wenham scored for the home side in a 1-2 defeat. Moody also noted that two games was a mark of a club on the up. Having joined in 2005, he has become an integral part of WIFC, and the club has become a huge part of his life. “Who would ever have thought back in 2005 as a 17 year old that I would have made so many great friends and connections and had such good times on the various foreign trips. WIFC has been a constant through a lot of highs and a few lows, and I’m thankful for that.” Myall also enthused about the club and the day ahead. “It’ll be a great day all round, as with two teams in action it will be a great occasion and we’ll have a good time entertaining the two opposition teams, having a drink or two and then watching the big boys in the afternoon. For me that’s what the IFA is all about” added Myall. WIFC joint managers Chris Davis and Dave Messenger have selected the squads for Saturday’s forthcoming IFA double header. 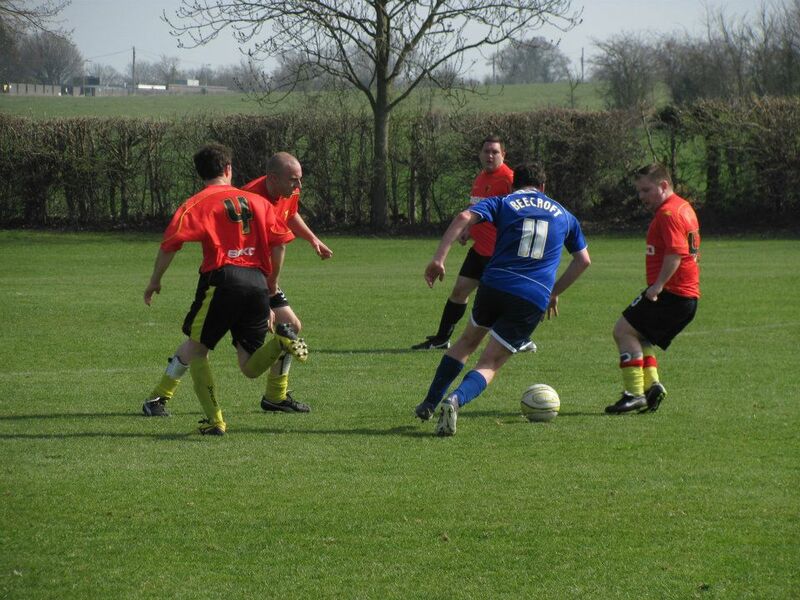 The Internet ‘Orns take on AFC Wimbledon in the semi-final of the London Cup, while also entertaining Punch Drunk FC, the Ipswich Supporters side who will be in town for the afternoon game at Vicarage Road, in an IFA league match. Davis and Messenger had some tough decisions to make, after an appeal for as many players as possible to fill both teams led to a 35 man pool of players. Maurice Clarke, Sam Copeland, Jimmy Davis, Chris Dew, Stuart Holdham, Andy Lewers, Joel Moody, Stuart Nicholls, Jamie Parkins, Frank Smith, Dave Soloway, Aidy Spender, Rob Sterry, Richard Walker, Paul Whittenbury, Dan Willis. Matt Ainsley, Tom Beck, Richard Betts, James Collins, Tim Down, Marc Duffy, Warren Flanagan, Simon Jones, Sam Mazurek, Dave Morren, Andy Myall, Martin Pollard, Alex Prentice, Daz Sear, Ed Sterry, Matt Wells, Richard Wenham. Both games will be played at Met Police Sports Club, Bushey with 10.30 kick offs. WIFC finally got back to winning ways this weekend with a convincing win against their counterparts from Coventry at the Bushey Met Police Club. Having made a few tactical changes at West Ham last weekend which went unrewarded, joint managers Chris Davis and Dave Messenger kept faith with the formation they’d tried in East London, and were handsomely rewarded with the best team performance of the season. Things got off to an encouraging start as the midfield platform provided by Stuart Holdham and Panos Fellas gave a solid base, allowing the forward players to get onto the ball. Early reward came when some classic back-to-goal centre forward play from Chris Dew, making his first appearance of the season after a number of injuries, led to a lay-off which was thumped home by full-back Rob Stone for his first goal for the club. Coventry struck back quickly and took advantage of a mix-up between Fellas and Matt Ainsley, which led to a break on goal with a man over. Ryan Harkin took the chance and duly leveled matters. However, WIFC were not be be denied and with the skiddy surface leading to a greasy ball, both teams were alert to the possibility of spilled shots. 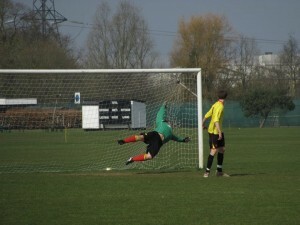 Dew took one such chance when the visiting keeper failed to hold a Dave Soloway drive to regain the lead. 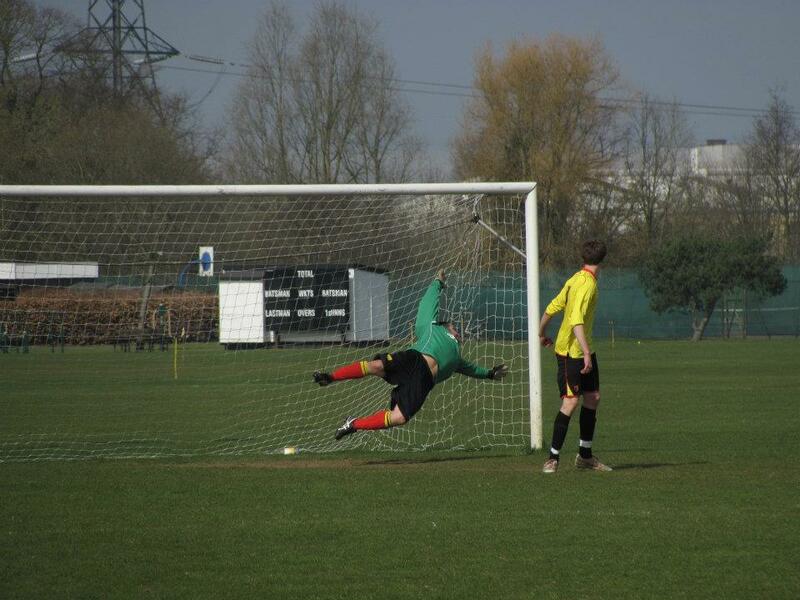 Soloway himself added a 3rd when he converted Dew’s pass inside a visiting defender, his 6th goal in 6 appearances this season and there was also time before the break for a Holdham air-shot when well placed to score from a corner and a rasping drive from skipper Joel Moody, which the Coventry keeper acrobatically tipped over the bar. The second half saw a number of changes but the team’s good performance continued. WIFC handed a debut to Andy Lewers and the young winger made an instant impact with a delightful curved pass into the path of the rampaging Dew, who took the ball into the area and capped a fine personal display with a clinical finish into the far corner. With Lewers and Richard Wenham to the fore, WIFC continued to create chances and it was no surprise when the evergreen Wenham slotted home a 5th. Coventry’s young side, to their credit, never gave up and plugged away, striking the bar and forcing a great save from Jeremy Hinds. But the home defence, led superbly by Dan Willis and converted midfielder Stuart Nicholls, kept on top and restricted the Sky Blues to half chances beyond those, Nicholls earning the Van der Vaart’s empty budweiser bottle man of the match award in the process. WIFC still created further opportunities at the other end. Lewers and Wenham both saw good chances go begging before Moody collected another Lewers pass and capped his 150th appearance for the club with his 8th goal of the season to complete the scoring. Jeremy Hinds; Rob Stone, Dan Willis, Stuart Nicholls, Matt Ainsley; Richard Murphy, Stuart Holdham, Panos Fellas, Dave Soloway, Joel Moody; Chris Dew. Subs Phil McBride, Richard Wenham, Mark Brennan, Andy Lewers, Andy Myall. WIFC welcome James Penny and the lads from Coventry City Supporters FC to Met Police this Saturday, for an IFA league clash. Cov’s fast improving young side have won 6 of their last 7 games and will present a stern test for the home side, who have only recorded 1 win so far in 2012. WIFC met a few of the Cov lads at Oxford recently, when Luke Hand, Jack King, James Tookey and Penny himself helped out on a one-game loan deal when we were short. Hand was among the scorers in a 3-5 reverse for WIFC. While this is only the second time WIFC have met this incarnation of the Cov side, the first being a hard-fought 2-1 win for Watford in the West Midlands last April, fixtures between the two sets of fans go way back to Worldnet in 1999, where WIFC recorded a 1-0 win thanks to an Aidy Spender strike. Since then, the majority of fixtures have been friendlies, as the previous Coventry team did not participate in league games, but a memorable clash in the knockout stages of Worldnet 2002 ended in a dramatic penalty shoot-out win for the Sky Blues. 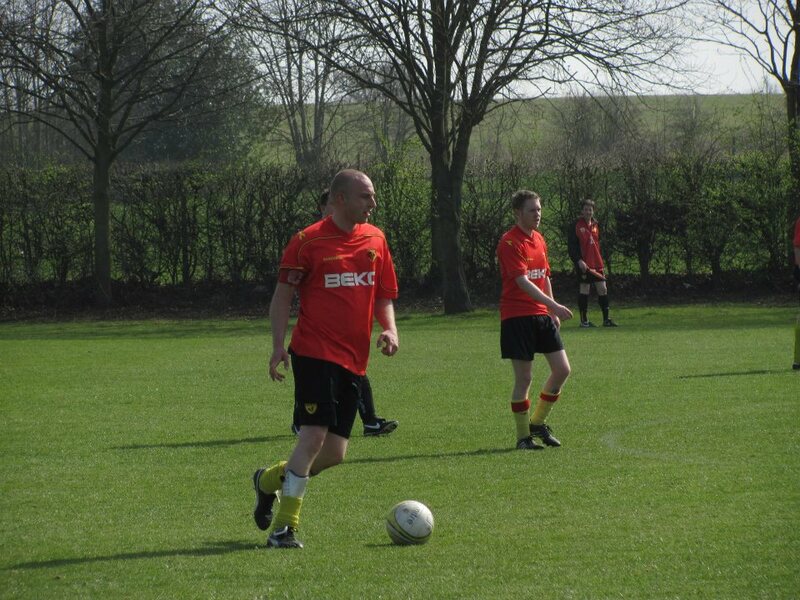 The last games against the original Coventry side were at Worldnet 2006, when the Sky Blues were drawn in the same group as Watford’s A and B teams, recording a 1-0 win against Simon Devon’s B team, but losing 2-1 to goals from Rob Sterry and Chris Dundon in the A team fixture. 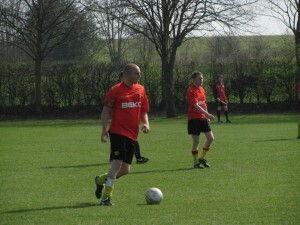 Their followed a four year hiatus before last April’s game, which saw goals from Joel Moody and a Paul Whittenbury penalty set up a desperate rearguard as Watford clung on for the win, with both joint managers Dave Messenger and Chris Davis among the defenders that held out for the points. WIFC went down to a heavy defeat at West Ham last Saturday, but the scoreline doesn’t tell the story. Having traveled without a keeper, we lost stand-in Tony Mehegan, borrowed from the hosts, to a nasty head injury early on and with Steve Eustice the only possible deputy we lost one of only two recognised strikers available on the day. Despite a good, battling performance we succumbed to defeat and while a full-time keeper may have given a more reflective scoreline, West Ham were worthy winners. Stu Holdham scored what turned out to be our consolation while debutant Mozzer Clarke impressed in midfield. 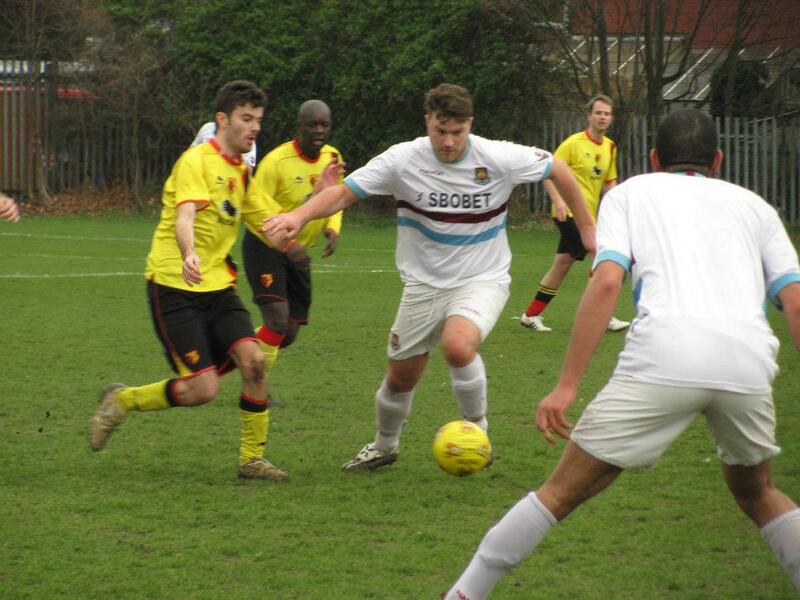 Sam Copeland made his 2nd appearance for the club alongside Stu, while Ben Frais made his 3rd appearance. We hope all three will be available regularly from here. Team. 4-4-1-1. Tony Mehegan; Rob Stone, Martin Pollard, Stu Nicholls, Matt Ainsley; Rich Murphy, Sam Copeland, Stu Holdham, Mark Brennan; Joel Moody; Steve Eustice. Subs Mozzer Clarke, Lozza Wells, Ben Frais. More pics are on the WIFC facebook page. Unfortunately this week’s efforts to find an opposition have been fruitless and as such we have a second consecutive weekend off. Please respond the thread on Facebook to notify us that you have received this message if you were originally available.